The NEC SV8100 8-Port Analog Extension Card CD-8LCA is used to connect 8 analog phones to the system. This card is one of the most popular ways to add analog extension ports to the NEC SV8100 telephone system. 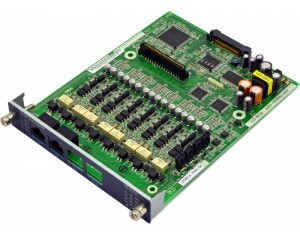 This card immediately expands the SV8100 phone system with 8 analog extension ports and can be further expanded by adding a 8-port daughter card to the CD-8LCA. Phone options include SLT devices (such as a cordless telephone) and fax machines.